The incendiary premise of his report, to be delivered to the UN’s 47-country Human Rights Council in Geneva this month, is that Israel is guilty of one of the worst crimes: deliberately and systematically attacking civilians and making them suffer as a war aim. The Israelis knew they would get pasted, as the council is a serial Israel-bashing outfit that often lets more egregious human-rights abusers around the world off the hook. But the report was even more critical than they had feared. 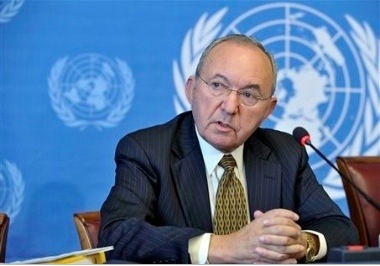 JOHANNESBURG — Ask Richard Goldstone what possessed him, a Jew and self-described supporter of Israel, to accept the job of chief United Nations investigator of alleged war crimes committed in Gaza last winter, and the legendary South African judge invokes his past. Had Richard Goldstone not served as the head of the UN inquiry into the Gaza war, the accusations against Israel would have been harsher, Goldstone's daughter, Nicole, said in an interview conducted in Hebrew with Army Radio on Wednesday. "My father took on this job because he thought he is doing the best thing for peace, for everyone, and also for Israel," Nicole Goldstone told Army Radio. Israel, he added, was one of the first countries to support the formation of permanent court of law for crimes against humanity - a proposal that came up following the successful performance of the special tribunals on Bosnia. Prime Minister Benjamin Netanyahu on Wednesday blasted a United Nations probe into Israel's winter offensive against Hamas as nothing but a "kangaroo court," after the investigators accused Israel of committing war crimes in a report. "The Goldstone report is a kangaroo court against Israel, whose consequences harm the struggle of democratic countries against terror," said Netanyahu during closed meetings, in his first response to the report, which was released on Tuesday. Susan Rice, the US ambassador to the United Nations, said Washington has had 'serious concerns' about the mandate given to the four-member Goldstone mission by the Geneva-based council. The US officially took its seat in the 46-member body in early September. 'We have long expressed our very serious concerns about the mandate given by the Human Rights Council prior to our joining it,' Rice said in her first reaction to the findings by Goldstone on Tuesday. 'We view the mandate as ... one-sided and basically unbalanced,' she said. She also objected to Goldstone's recommendations, including one for the 15-nation Security Council to investigate and refer the war crimes to the International Criminal Court at The Hague. The State Department said the conclusions of a U.N. commission headed by South African justice Richard Goldstone were unfair to Israel and did not fully address the role of the militant Palestinian group Hamas in the conflict. And it said the U.S. objected to a recommendation that alleged crimes be referred to the International Criminal Court. "Although the report addresses all sides of the conflict, its overwhelming focus is on the actions of Israel," spokesman Ian Kelly told reporters. A non-sensical position, of course, considering that the vast majority of the damage was made by Israel, not Hamas. The UN report, obtained by the Guardian, reveals the delays facing the delivery of even the most basic aid. On average, it takes 85 days to get shelter kits into Gaza, 68 days to deliver health and paediatric hygiene kits, and 39 days for household items such as bedding and kitchen utensils. Among the many items delayed are notebooks and textbooks for children returning to school. As many as 120 truckloads of stationery were "stranded" in the West Bank and Israel due to "ongoing delays in approval". There were "continued difficulties" in importing English textbooks for grades four to nine – affecting 130,000 children – and material used to print textbooks for several subjects in grades one to nine. Government schools were reported to lack paper and chalk, while the UN Relief and Works Agency, which supports Palestinian refugees and runs many schools in Gaza, was still waiting to import 4,000 desks and 5,000 chairs. The UN says the current situation "contravenes" a UN security council resolution passed during the war in January, which called for "unimpeded provision and distribution" of humanitarian aid for Gaza. "The result is a gradual process of de-development across all sectors, devastating livelihoods, increasing unemployment and resulting in increased aid dependency amongst the population," says the report from the UN Office of the Humanitarian Co-ordinator. According to UN statistics, around 70% of Gazans live on less than a dollar a day, 75% rely on food aid and 60% have no daily access to water. As many as 20,000 Palestinians are still displaced after the war, most living with relatives or renting apartments. Among the most urgent needs is glass to repair shattered windows before the winter rains. Glass, along with other construction materials, is one of the many items banned by Israel from entering the strip. The UN also wanted to deliver agricultural products to reach farmers in time for their main planting season over the next few months. Industrial fuel was required for the power plant, along with bank notes for aid projects and salaries. The Guardian has made the full report available here. Amnesty International has endorsed and defended the conclusions of the report, and Human Rights Watch has also been a supporter of Justice Goldstone. Even the British House of Lords debate on this issue last May displayed a determination that there be no double standard and that Israel be held accountable for any crimes it committed-- likewise Hamas. Israel is deeply dependent on trade and technological sharing with Europe, and the Goldstone report will give a fillip to the boycott movement. It will also cast a long shadow on future Israeli wars on its neighbors and how they are perceived, as Aluf Benn argues in Haaretz. I agree that this report should be leveraged in the growing Boycott-Divestment-Sanctions effort. The Lebanon and Gaza wars have deeply affected Israel's image in Europe and even the US, the question is how to maintain, build upon and amplify this increasingly widespread disgust at Israel into impact on politicians. The EU - admittedly not a very democratic institution, in the sense that its joint foreign policy is made with even less accountability or oversight than the policy of member states - still has to react strongly, for instance by halting any further rapprochement in EU-Israel relations. This report, alongside with the refusal of the Netanyuahu government to end settlement expansion, never mind dismantle settlements (which are all illegal pending final status negotiations) paints an ever-more convincing picture of Israel as the key obstruction to peace. The question is whether the Obama administration, as well as EU countries, are able to make a radical break with the past practices that have worked so poorly. This approach only causes a loss of Arab trust in the willingness of Israeli governments to do justice by the Palestinians; it mortally undermines their trust in the willingness of the Americans to use their power and influence in order to carry out U.S. interests in the region. If Obama is worried about fighting with the gatekeeper, and so lets Netanyahu rule the vineyard, we will all eat grapes of wrath. For ideas at what small even small steps might be, take a look at Shana Marshall's recent proposal.